PHILADELPHIA, Sept. 10, 2018 /PRNewswire/ -- Schneider Electric, the global specialist in energy management and automation, today announced their participation with the PennFIRST team to design and build a new state-of-the-art pavilion featuring smart building technology for power and building management systems for the University of Pennsylvania Health System (Penn Medicine). EcoStruxure™ for Healthcare, an IoT-enabled digital hospital architecture, will help enable Penn Medicine to reduce costs, optimize energy use, increase staff efficiency and much more, long into the future. As part of the Integrated Project Delivery process, the PennFIRST team selected Schneider Electric as the key trade subcontractor (KTS) for low voltage integration and building management systems. Schneider Electric will join the existing PennFIRST team, which includes several other trade contractor partners, Penn Medicine as owner, Foster+Partners and HDR as architectural designers, BR+A for engineering design and Balfour Beatty and L.F. Driscoll for construction management. Also through the electrical KTS, William A. J. Shaeffer's Sons, Schneider Electric was selected as the energy and power management supplier. Schneider Electric's team has a strong existing relationship with Penn Medicine, having worked with the healthcare system for over 15 years. Schneider Electric's power management systems allow Penn Medicine to ensure that their power distribution network is running efficiently. This includes reducing the number and duration of unplanned power outages, reducing energy consumption, reducing unplanned maintenance, optimizing the loading of key equipment, and ensuring regulatory compliance with reporting and tracking on power systems and availability, all while ensuring patient safety and satisfaction. Once complete, the connected electrical system will enable the hospital to monitor and control energy usage, as well as proactively monitor for any potential building and equipment faults and issue alerts before they occur so that the hospital can take a conditions-based approach to maintenance rather than dealing with any issues reactively. Over the last two years, Schneider Electric has worked with the PennFIRST team as a technology consultant reviewing the low voltage systems and possible integrations to be designed and delivered in the new facility. Schneider Electric has worked with the team to set up technology vendor demonstrations, conduct user group workshops, and recently commissioned and built a Low Voltage Integration Lab in the project's co-located office near the project site. Through their extensive experience implementing smart buildings technology in leading healthcare facilities, Schneider Electric has over 100 healthcare solution use cases that deliver value in a hospital environment to build the hospitals of the future. Now as a KTS, Schneider Electric will continue to work with the PennFIRST team to configure and evaluate the low voltage systems and use cases that leverage EcoStruxure for Healthcare as the technology backbone in the patient room for clinical and patient value. One example of a use case is Schneider Electric's Clinical Environment Optimization solution, which saves energy by automatically adjusting room conditions based on occupancy information and allows patients to ensure that they are comfortable by setting their room temperature through the patient room control mobile app. These savings can then be used to address maintenance backlogs, and for investing in patient care initiatives. "Schneider Electric is highly focused on the healthcare market and has provided state-of-the-art energy management, power management, clinical environment optimization, and security management systems to multiple leading healthcare facilities," said Jim Sandelin, senior vice president at Schneider Electric. 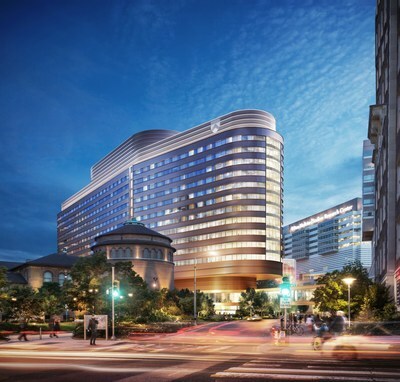 "Building upon the existing trusted relationship of the Square D team with the University of Pennsylvania and Penn Medicine teams, we are proud to assist Penn Medicine to integrate the latest, most advanced energy-saving technologies and techniques to remain on the cutting edge of patient care and develop the hospital of the future." "The team at Schneider Electric has acted as a true partner throughout the design and now construction of the Pavilion," said Stephen Greulich, senior project manager at the University of Pennsylvania Health System. "They are deeply embedded into the project team and are a vital part of helping us achieve the project's vision and aspiration to provide the highest standards of patient care while closely controlling energy usage and costs." To serve the evolving needs of patient comfort and satisfaction and to ensure clinicians can deliver the latest treatments and patient care techniques, Penn Medicine needed to expand their facilities. Penn Medicine's new Pavilion will provide a new clinical facility adding approximately 500 new beds, a relocated emergency department, and 47 operating and procedure rooms. Construction of the Pavilion began in September 2016 and will progress through early 2021, with occupancy projected later in 2021. This is one of the largest projects on the East Coast to design and build through a Lean Integrated Project Delivery (IPD) approach. In a traditional design and construction approach, each firm works on their respective project role and scope separately and linearly. In contrast, in IPD, the team works side by side from the beginning of the design process. With incentive through a shared profit model, the resulting collaboration saves time and money through innovation and solves challenges in real time.